Perfect for creating a special false nails by yourself. For professional natural nail extension. Color: Natural. What is in the box. Great Gift. False Nails. FREE - 2g Nail Glue & Small Prep File with False Nails. Opaque / Natural Colour Nails with10 different sizes. Professional Nails. Nail Gel Polish UV/LED. Nail Accessories. Strong Nail Glue. 100 Long Good Quality Full Cover Coloured False Nails from "PINK CANDY"
500 NATURAL OPAQUE - Full Cover COFFIN SHAPED Nails 12 sizes- NAIL GLUE IS NOT INCLUDED. 500 COFFIN type nails to paint yourself - amounts are approximate. Paint in any colour you wish and add crystals for a gorgeous effect. 600 Natural Stiletto Points Full False Nails FREE GLUE "PINK CANDY"
600 NATURAL OPAQUE Plain Salon Cusp points - Full Cover Nails - A 2G NAIL GLUE IS INCLUDED. 600 cusp/point type nails - amounts are approximate. Largest nail is 15mm wide and 24mm long. Smallest nail is 7mm wide and 19mm long. 5 out of 5 stars - 600 Natural Stiletto Points Full False Nails FREE GLUE "PINK CANDY"
2 product ratings2 product ratings - 600 Natural Stiletto Points Full False Nails FREE GLUE "PINK CANDY"
Suitable for nail extension with nail art decorations. Type: False Full Nail. Quantity: 500 Pcs. Color: Clear. What is in the box. 10 different sizes for optimum fit. For professional Clear nail extension. Perfect for creating a special false nails by yourself. Color: Clear. 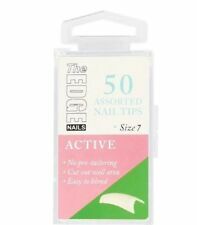 You are getting approx 600 plain false nails - 10 sizes 0 to 9. 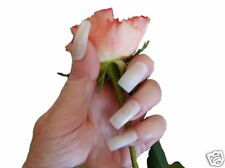 These are long nails and you may have to trim and file any rough edges to achieve a gorgeou s finish. The largest nail size 0 is 14mm wide and 27mm long - the smallest nail size 9 is 7mm wide and 19mm long. 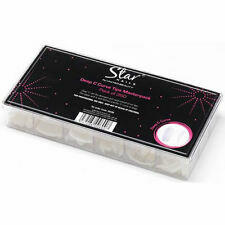 You are getting approx 500 plain false nails - 10 sizes 0 to 9. These are long nails and you may have to trim and file any rough edges to achieve a gorgeou s finish. The largest nail size 0 is 14mm wide and 27mm long - the smallest nail size 9 is 7mm wide and 19mm long. 24pcs Artificial Nails. 12pcs Artificial Nails. 24pcs Diamond Nails. 24pcs 3D Nails. 12pcs 3D Nails. Apply nails in warm water for 5~10 minutes gently peel pre-glued nail from each finger from cuticle. 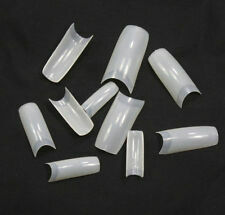 SET OF approx 500 NATURAL OPAQUE FULL COVER FALSE NAILS. You are getting approx 500 opaque false nails - 50 of each of sizes 0 to 9. These are long nails but you can cut them down for short. The largest nail size 0 is 15mm wide and 28mm long - the smallest nail size 9 is 7mm wide and 19mm wide. 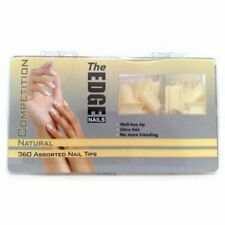 120 NATURAL OPAQUE - Full Cover COFFIN SHAPED Nails 12 sizes- NAIL GLUE IS NOT INCLUDED. 120 COFFIN type nails to paint yourself - amounts are approximate. Paint in any colour you wish and add crystals for a gorgeous effect. For professional natural nail extension. Professional false full nail. 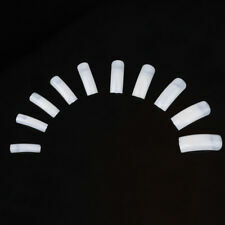 500 x High Quality White False Nail Art Full Nails. Perfect for creating a special false nails by yourself. Color: White. What is in the box. Firstly, clean and polish your nails with a nail file simply. Secondly, press 1 pc glue sticker on the back of the false nails. Finally, press the false nail with glue sticker on your polished nail for 10 seconds. 600 Approx CLEAR STILETTO False Nails Full Cover Nails FREE GLUE "PINK CANDY"